Vacuum slippers: The new trend in house cleaning? Siberian students have designed vacuum cleaner slippers for people with back problems. Young people hate vacuuming, and that's why students at the Polytechnic University in the Russian city of Tomsk have designed new vacuum cleaner slippers. One can remove dust or litter off the floor without bending over. The device weighs less than 5 kilos (11 pounds), and can be useful for people with back problems. It consists of a conventional vacuum cleaner placed in a backpack, polystyrene slippers and a hose that connects them to the vacuum cleaner. Test results showed high cleaning quality, but the developers are planning to improve the design if they find investors. 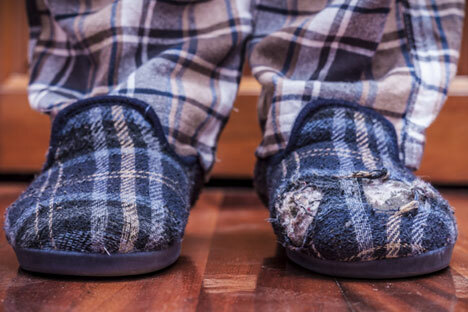 "The slippers coped well, and they can be efficiently used both to pick up dust in the corners --- you just need to turn the slippers to the side --- and to clean the carpet," the developers said. According to estimates, the device's sale price will be in the range of $30 to $100, depending on accessories. Vacuum slippers are not new, however. Indonesian industrial designer, Adika Titut Triyugo, developed a vacuum footwear cleaner called, Foki Shoe, which is a rechargeable rubber-lined plastic slipper with rotary cleaners.